This is it, the LAST day of my 31-recipe challenge! It officially took me 22 days to cook 31 30 recipes. And I’m exhausted. Later this week I’ll put together a recap post that looks over everything I made last month and what I took away from it, much like I did at the halfway point. And, to go out with a bang (well, a shake), I FINALLY nailed a dessert! But I want to go out on a high note, so I’m going to save the shake for last and start with my last-night-of-the-challenge dinner: Beef Pho from Zen Can Cook. The broth was easy enough to make, if not pricey–star anise, cinnamon sticks and fennel seeds don’t come cheap, and I couldn’t even find a black cardamom pod–but they impart a really exotic, interesting flavor. It did make my place smell preeetty weird the first night, though. The only slightly “off” thing about this dish was the beef itself–I used a top round to make the broth, and despite the fact that it literally sat in liquid all night, it was pretty dry when I took it out and sliced it up. It came back to life a bit once the slices were re-added to the heated broth, but it wasn’t the tender, juicy meat I was expecting. It was actually the low point of the dish. 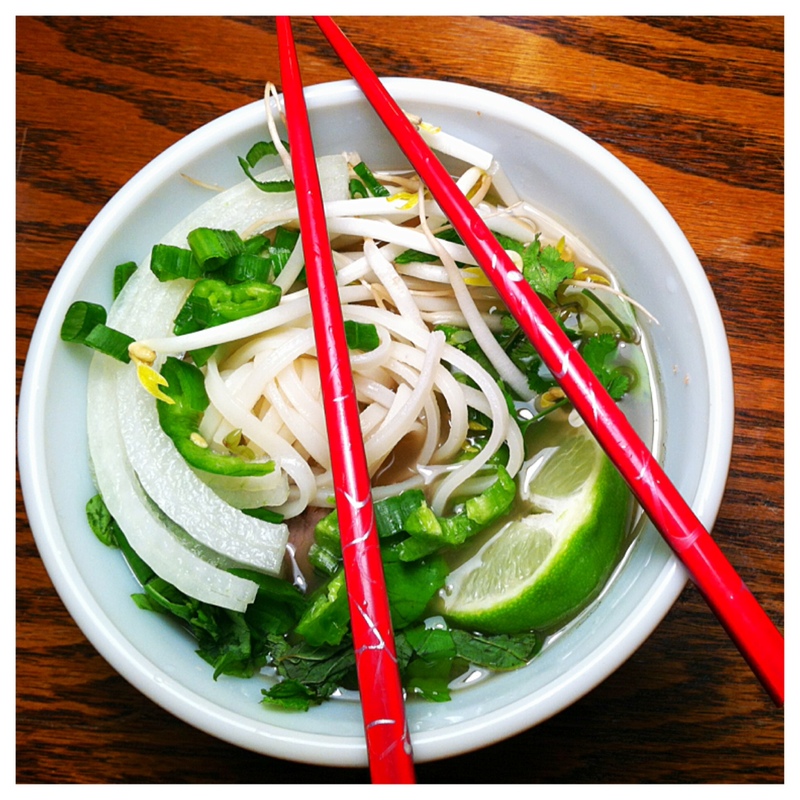 Otherwise, though, the pho was quite tasty–lots of fresh herbs, peppers and rice noodles in the warm, beefy broth. Much like the soba, this was a total comfort food. I wish I had this around when I was sick. I had to make a couple of slight substitutions based on what was available. I couldn’t find any Thai basil, so I subbed in regular basil even though there’s a flavor difference. It was better than nothing. I also used a regular green long hot (seeds scraped out) in place of a Thai bird chili, which my local grocery store also didn’t sell. Nonetheless, the flavor was still bright and vibrant, and I highly recommend this. It seems so much more complicated than it really is. Once the broth’s made, it’s really just cooking the noodles and slicing up some veggies, herbs and beef. Done and done. My only recommendation? I used only one cut of meat in my broth, because it was available and exactly the amount I needed. I would recommend mixing it up, and next time, I’d use oxtail. I almost went with it this time but opted not to. I think it would add even more depth and meatiness to the broth. But now, for what we’ve all been waiting for…dessert! 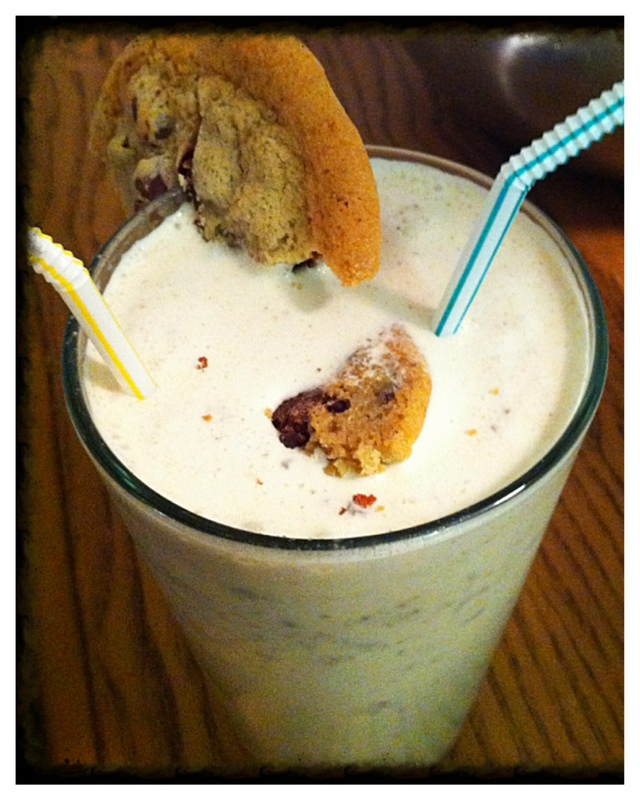 Let’s just put this out there: Chocolate chip cookie Bailey’s milkshakes. You can screw this up nine ways to Sunday, and it would still taste fantastic. Because you can’t go wrong with chocolate chip cookies, Bailey’s and coffee ice cream. And, it’s a cinch! Add ice cream, Bailey’s, cookies and ice to a blender, blend, drink. If you actually do screw that up nine ways to Sunday, I might worry. Now, I could’ve gone ahead and really pulled out all the stops and baked my own cookies to put in the milkshake (and that had been my original plan), but time became an issue, so I bought a few chewy, yummy cookies from the Wegman’s bakery department. And, frankly, they were probably more delicious than whatever I would have baked. So win-win. Hopefully in a couple of weeks I’ll regain the strength to lift a pot or light a stove. Until then, I’m reveling in the beauty that is takeout (sushi!) and leftovers.